Tangier is beautiful city. We were lucky to have been woken up by the fresh sea breeze (and our blaring alarms). While we were in deep slumber, our friends Sara and Eran had already experienced an adventure. At 4:30am, the two lucky ones with Spanish passports were in a “grand taxi” on their way to Ceuta, the Spanish administered city that is situated on the northern frontier of the Moroccan landmass. 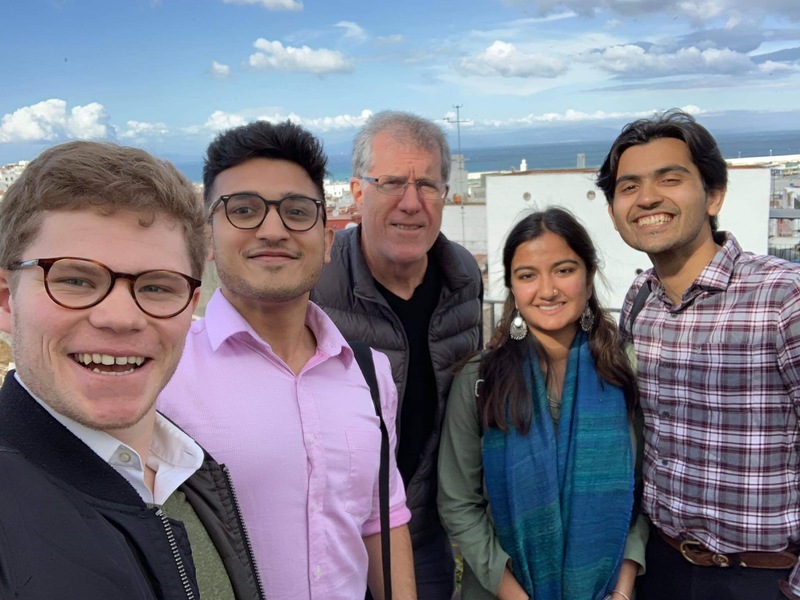 Ceuta, separated from Spain only by the Strait of Gibraltar, is still firmly considered an integral part of Spain by many, including the authorities at the Spanish Embassy in Rabat we had interviewed the previous day. Over the last semester, we had been studying the harrowing tales of refugees and migrants attempting to scale the barbed walls of Ceuta and cross over into Europe for a better life. Witnessing this journey firsthand emphasized the need to recognize migration as a human phenomenon. At 5:45am, the “grand taxi” arrived at the Ceuta border, where there was a 2.5 kilometer-long line of Moroccan workers waiting to enter Ceuta. Sara and Eran were approached by a man who confidently provided them the papers they needed and offered insights on executing a smooth crossing. He charged 50 Moroccan Dirhams (roughly $5) for the necessary white papers. His role was murky, perhaps he represented the informal border control that Sara had studied in one of her classes at Tufts. This man wielded a prized skill that rendered him invaluable: the Spanish language. Once Sara and Eran reached the Border Officer, they realized the flaw in their ambitious plan. Eran, a dual citizen of Turkey and Spain, had forgotten his Turkish passport in the apartment. They decided to retrieve it from Tangier. With fellow travelers in the taxi, at the crack of dawn, they set out to retrieve their passports from the apartment, just as my friends and I opened our eyes to the messages of their eventful morning. Dressed sharply and energized by cafe noirs and pain au chocolats, Kai, Taylor, Atrey, and I left our apartment for the Darna Youth Center. With the help of a kind lady who chaperoned us up the hill overlooking the turquoise blue coast of Tangier, we arrived at one of Darna’s six centers. The centers specialize in assisting youth, children, women, migrants, and other marginalized individuals to integrate into society. In their bright courtyard painted with pastel colors and ornamented with flora, the women of Darna told us that they believed that the Moroccan education and healthcare system were corrupt and needed institutional changes. At their centers, they provided the socioeconomically underprivileged with education, art, community, and love. We were touched to see their work across Tangier to help people who had been failed by their communities and the government. Meanwhile, Sara and Eran were joined by Aly on their return trip to the Ceuta border. It was thought provoking to see the income disparities as the long line of migrants could not afford to avail the services of “facilitators” at the border. The “facilitating” services and businesses often resemble an economic firm, where several individuals cooperate and fix prices to create a synergetic network of people transferring money, bribing border officials, organizing transport, and creating safe houses. Sara, Eran and Aly finally crossed over into Ceuta. Over there, they visited the Centro de Estancia Temporal de Immigrants (CETI), which is the temporary holding center for immigrants. Although they weren’t allowed too far into the premises, they discussed the necessity of migrants in any economy, the conflict of Spanish and Moroccan identities, and the need for border reforms. After a heart-warming visit to Darna, the four of us caught taxis to the Abdelmalik Essaâdi University, where we interacted with college youth, conducted surveys, and met with the USAID Career Counseling Office. We were greeted warmly and given a tour of the office that works to provide students at the University with communication skills, career solutions, and access to essential resources and databases. We learned that there is a growing demand for educated young Moroccans in France, Belgium, and Netherlands. With the IT and Industrial sectors growing the fastest in Morocco, young Moroccans require basic English proficiency to earn a better life. However, the education system is the dominant barrier to the Moroccan and migrant population’s development as the schools teach subjects in Arabic and college education is conducted in French. Therefore, the students struggle and the migrants from non-Francophone countries are unable to integrate and then desire to migrate to Europe. However, the USAID program managers expressed optimism about their students’ futures, as a majority of them are now better geared toward careers in engineering and medicine. With the right assistance, the Office believed, young Moroccans can go a long way in shaping their country’s future. Our final interview of the day took place at the Tangier American Legation Institute for Moroccan Studies (TALIM), a vibrant center of activity in the old medina. The facility houses is a museum, research library, and cultural center. TALIM is the research center in Morocco of the American Institute for Maghrib Studies, part of the Council of American Overseas Research Centers. With a panoramic view of the houses nestled above the pristine coast, we spoke at length about migration, education, and politics. Before analyzing migration from Morocco to Europe, we must first realize that for every 1,000 to 2,000 migrants entering Europe from the Middle East and North Africa (MENA) region, there are 1-2 million migrants migrating within Africa. Tangier’s rapid industrialization, dominated by the automobile and tourism industry, has made it an attractive city for migrants, especially after creating more than 40,000 jobs in a short amount of time. Furthermore, Morocco’s reintegration into the African Union and negotiations in ECOWAS meant the Morocco was not being “bought out” by the European Union. Therefore, the Legation believed that Morocco’s immigration and foreign policies were largely a product of African regional politics rather than purely Eurocentric, which is how it is often portrayed by the media. We also learned that gender played a strong role in Senegal-Morocco migration patterns as hair salon owning Senegalese women set up cross-country markets for the movement of specialized. labor. We were left with the final idea that the migration no one has focused on is the internal migration of Moroccans from rural to urban areas. Education, health, and social policies must be amended to keep pace with the rapid urbanization of Morocco. The lack of socio-economic development compromises the quality of life of the young Moroccan as well, leading these youths to distrust the political system. As I write this, we are all in our apartment exchanging stories. We experienced two major perspectives of the Moroccan migration crisis: the strife of domestic migrants hoping to integrate and the treacherous lives of migrants at the northern frontier of Ceuta. We were reminded today that we are researching humans with real emotions in a country with a kaleidoscope of cultures, languages, ideas, and people. I am grateful for Tangier and all its beauty as I look forward to what we will learn in Marrakech tomorrow. After having breakfast in Fes, Reed, Ezgi, Vinicius and I left Fes for a day trip to Ifrane, where Al Akhawayn University is located. Al Akhawayn University is one of the most prominent universities in Morocco. It was founded in 1995, and it is based on the American educational system. Members of our group also interviewed Gabriella Moocarme and Caleb Eromdu from The Leadership Development Institute. The Leadership Development Institute uniquely develops selected students to become global leaders by adapting the best American leadership development research and practices to the needs of Moroccan students and Moroccan society. The LDI is the first such program in Morocco, one of few in the Middle East North Africa (MENA) region, and one of very few in the developing world. From its roots, the LDI is a co-curricular program teaching leadership skills through experience and service. We also met with the Director of the International Program, Said Nouamani. Later in the day, members of our group had the opportunity to socialize with various people at the university, including Professor Zaynab El Bernoussi, who specializes in international studies; Paul Love, who specializes in North African history and Islamic studies, and a range of students. After a long day of interviews, we returned to our hotel barely in time for dinner and met with Uzair, who spent the day conducting research about water systems in the medina. Uzair interviewed an Associate at the Water Engineering Development Institute of Fes. At night we sat on the beautiful hotel terrace overseeing Fes, reflecting on our interviews from the day and later playing cards with other travellers we met at the hotel.